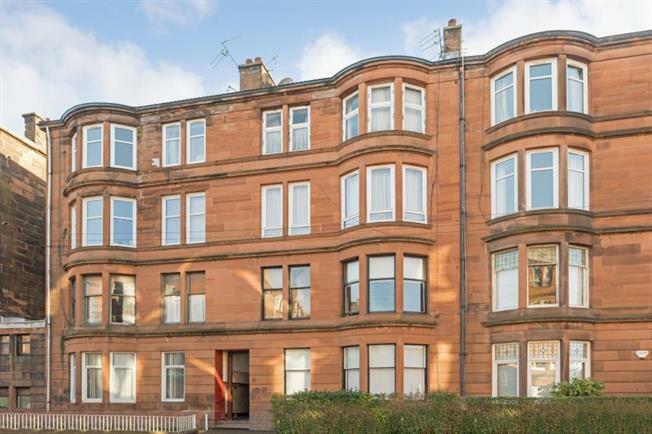 2 Bedroom Ground Floor Flat For Sale in Glasgow for Fixed Price £160,000. OPEN HOUSE SAT 27th AND SUN 28th APRIL. CONTACT BRANCH FOR FURTHER DETAILS. Set within one of the South-side's most vibrant locations, 9 Frankfort Street offers a unique opportunity to purchase one of the best designed, most beautifully presented ground floor flats in the Southside of Glasgow. The property boasts the perfect combination of traditional style and luxury modern features and is uniquely suited to purchasers seeking a flat in walk-in condition. The property consists of fabulous reception hallway, stunning and expansive bay windowed lounge, stylish modern newly installed fitted kitchen with integrated appliances, two delightful bedrooms and luxury bathroom. The property is further complimented by double glazing, gas central heating, security entry and communal rear gardens. Frankfort Street enjoys easy access to great local bars, restaurants and delicatessens and is situated close by to train lines and a well served bus route. This is a truly outstanding property inside and out - viewing at the earliest opportunity is highly recommended.